Ice cream sticks are a craft supply that I love having full stock of. They are inexpensive, durable and super easy to create with. 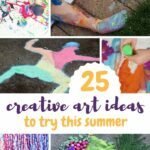 We have found so many fun ideas that involve crafting, creating and even helping my kids learn. 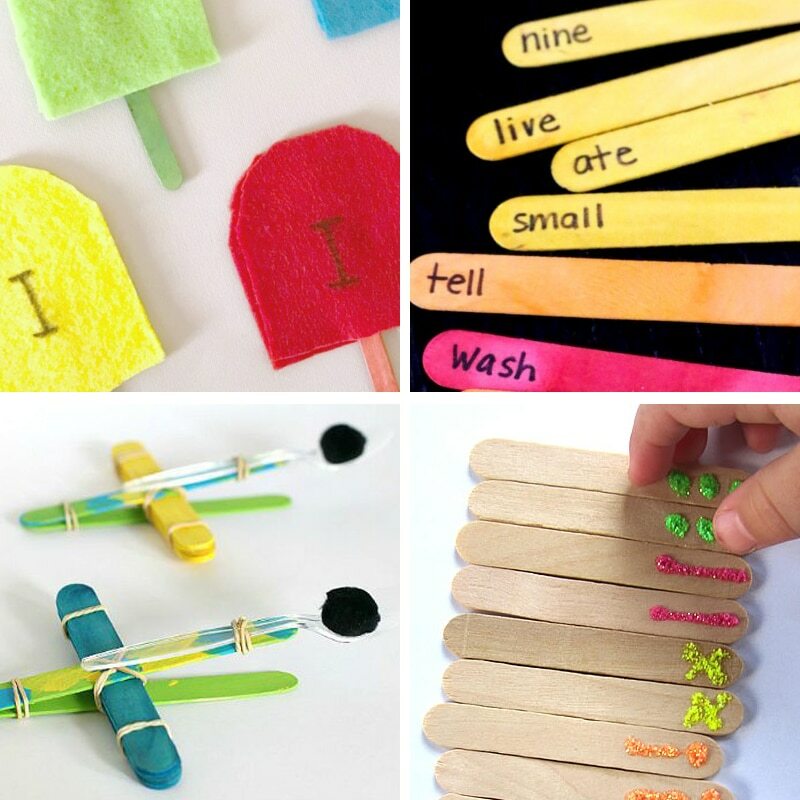 Popsicle sticks are fantastic for helping strengthen fine motor skills for kids and so much more. 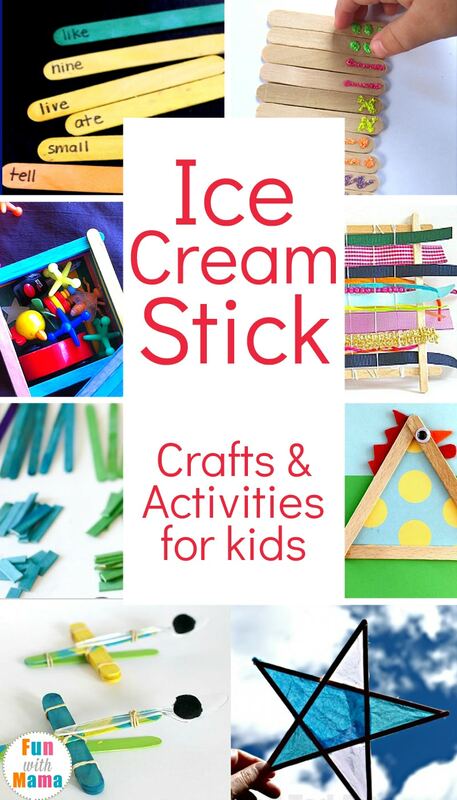 These are some of our favorite Ice Cream Stick Crafts, Ideas and Ice Cream Stick Learning Activities. We created our own DIY Stamps using popsicle sticks as the handles and foam as the stamp pieces. 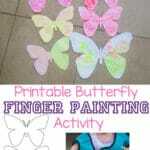 This was such a fun activity to craft as well as create with. Did you know that with a little patience and this super fun technique, ice cream sticks can be bent into a circular shape? This makes a fabulous way to create pretend play bracelets for your princess or super hero! These lanterns are so fun. Kids can create their own designs and add their own touches while the popsicle sticks hold up as the frame. This is perfect for a summer night or a sleep over! Weaving is an incredible craft that helps strengthen fine motor skills for kids. This Homemade Weaving Loom Using Popsicle Sticks is a super simple way to encourage this activity. Have you ever created with spin art? If not, you should! It is super fun. When the creations are made it is easy to turn them into extra special decorations with the help of popsicle sticks, just like these Rainbow Painted Flowers. We love painting and creating with open ended art. This can be difficult with super little ones because they like to put everything in their mouth. 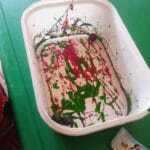 Fortunately this Taste Safe Ice Painting, with ice cream stick handles, is perfectly safe for even babies. Kids will have a blast with this process art! 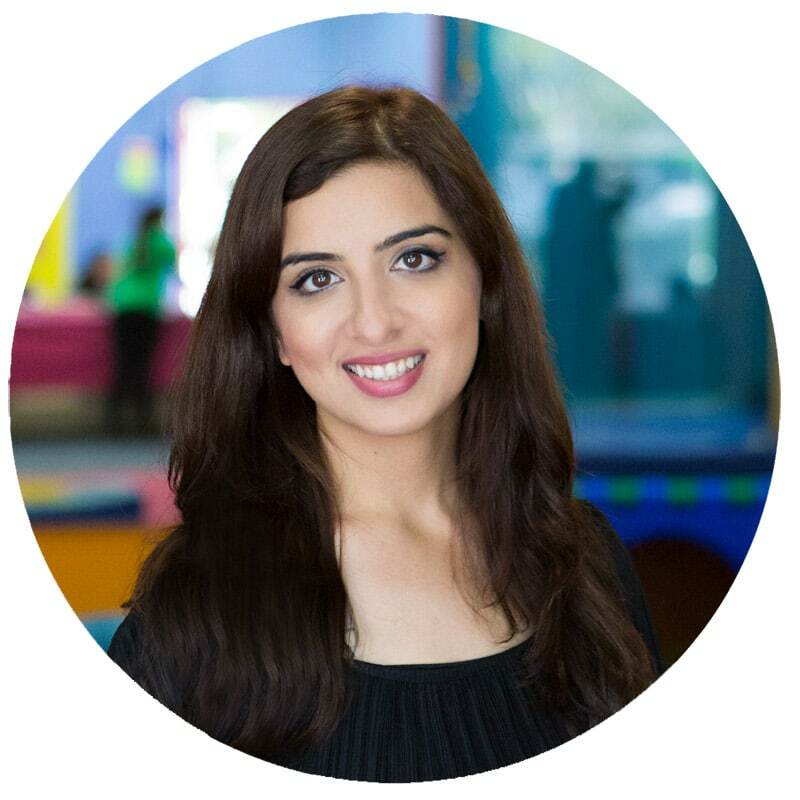 Does your child like imaginative pretend play with fairies? It is fun to create small worlds for them to get lost in with their imagination. A perfect addition to a fairy small world is a Fairy Door. I also really like this Fairy Door! If you need fairies to play with the fairy doors, these popsicle stick Fairy Crafts are too cute and look super easy. Another small world craft using popsicle sticks is this super cute Camping Set. Kids can pretend to play and even take them on a trip with you. 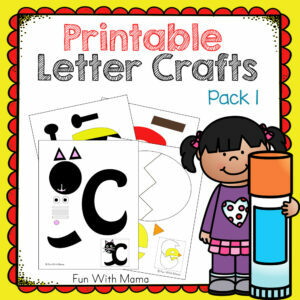 This craft stick craft is perfect for pretend play also. Each popsicle stick is used to make another member of a family. 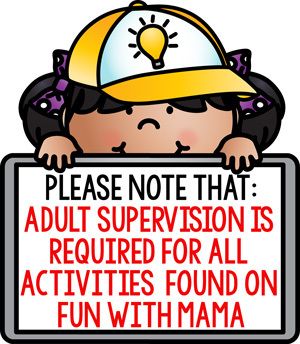 This provides a way for kids to pretend in a real life way. In this popsicle stick craft for kids, each stick is decorated in its own individual way but together creates a beautiful masterpiece! 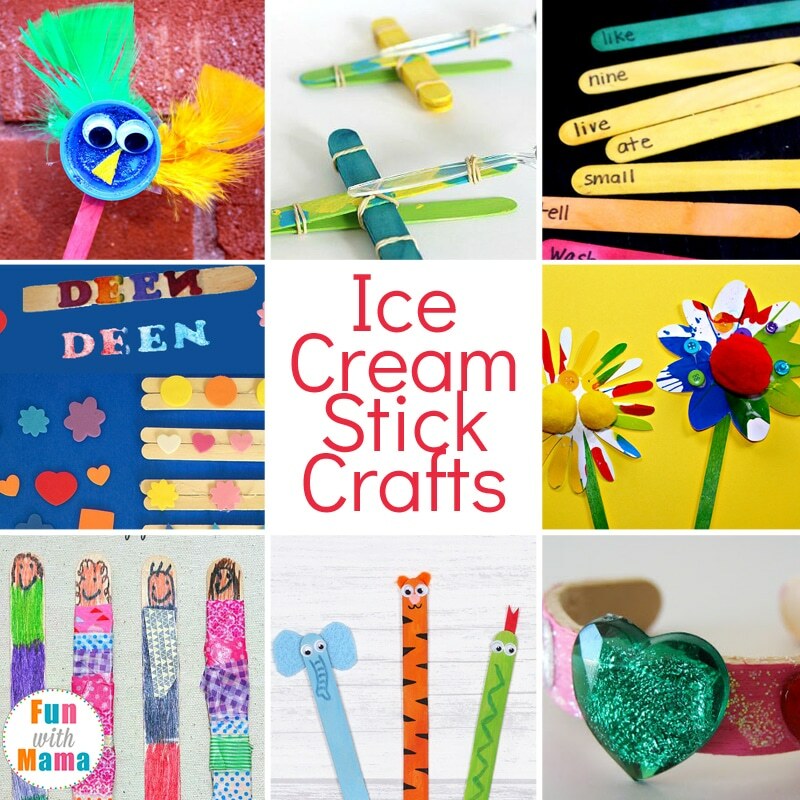 This Ice cream stick craft is super cute! If you’re creating a garden with flowers, these Craft Stick Dragonflies are a must. They are so cute and it would be super fun to customize each one different from one another. This Popsicle Stick Butterfly is a garden must have too! This popsicle stick craft for kids is a fun Mix n Match Snake. The pieces actually move around to resemble a slither of a snake. Kids can create different designs on each popsicle stick to make a fun moving snake. Do your kids like building and creating with blocks? These DIY Craft Stick Magneitc Art will be right up their alley. Use the sticks to outline an image and they stay in place! Kids love puppets, don’t they? These adorable popsicle stick puppets are the perfect popsicle stick crafts for creative kids who love pretend play! 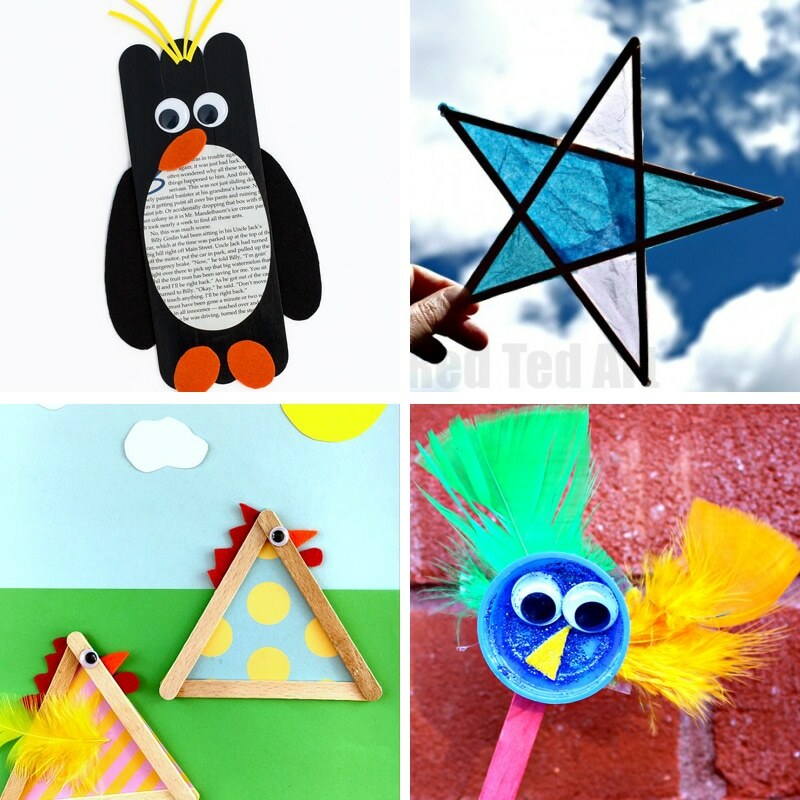 These are also super fun popsicle stick puppets! I also really like these super cute, and very creative, bird puppets. If your child loves birds, they will probably love these super easy Popsicle Stick Chicks! Popsicle sticks are the frame of the birds but each bird can be customized per the child’s preferences! Thin ice cream sticks are used to create these super fun stars. They can hang on windows or from the ceiling and add sweet touches to any room! Ice cream sticks are the core of this absolutely adorable penguin craft. If you are doing a penguin unit or just really love penguins, this is a must make! If you are looking for more zoo animal popsicle stick crafts, these are super cute as well! 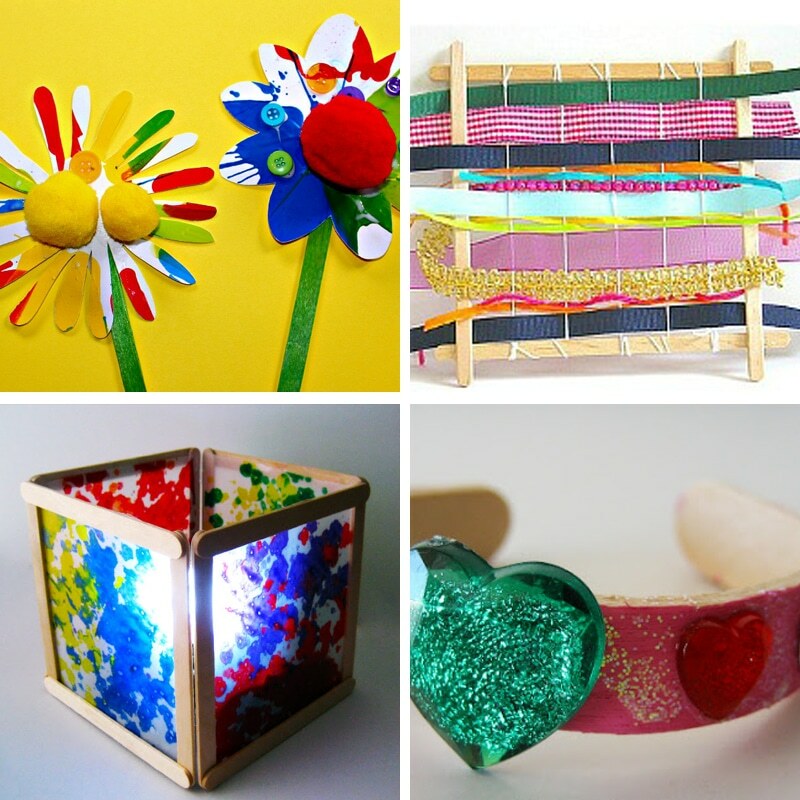 Most kids love making crafts that can be displayed in their home. This super easy Popsicle Stick Magnet craft not only can be displayed but can help display other artwork that they may create. Do your kids like trains? These popsicle sticks make fabulous train tracks that can be moved all over the small world. If your train yard needs a fence, these popsicle stick fences would be a perfect match! Grandparents would absolutely love to receive this sweet Ice Cream Stick Magnetic Photo Frame with a picture of their precious grandchild inside. It is super easy to make and will be cherished always! I LOVE this use of popsicle sticks. This Tic Tac Toe game is fantastic to carry and play anywhere. This could easily be taken to a restaurant or doctors office to keep children occupied when they may be bored. I think all kids like to have a chest they can put their little treasures in. This treasure chest is adorable and the best part is kids can create it on their own with popsicle sticks! 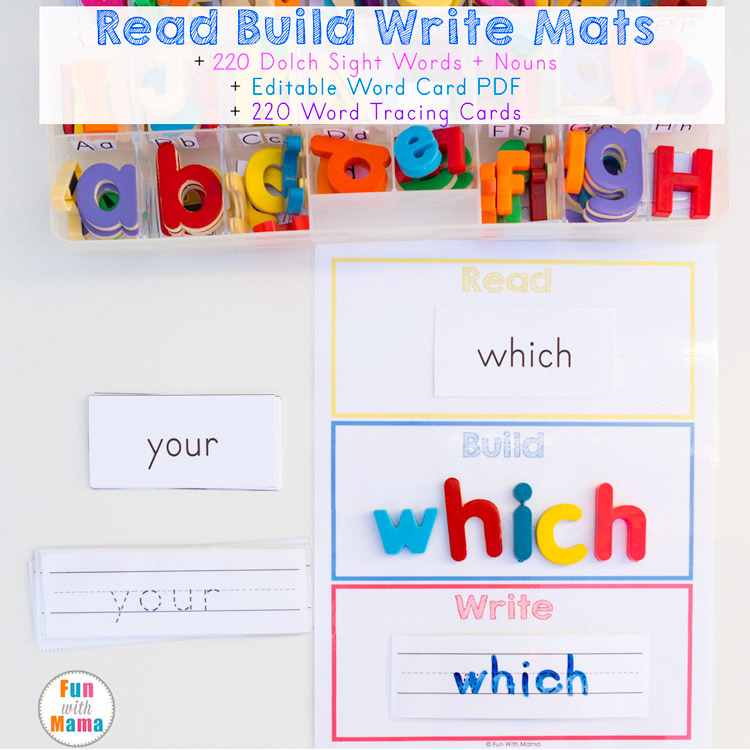 This sight word game is perfect for children who are learning sight words! I love that it can be taken in the car, played with in a restaurant and also makes a fabulous quiet activity at home. Hands on activities is how most children learn best. This I is for Ice Cream stick activity is a perfect way to incorporate learning letters with a fun game. 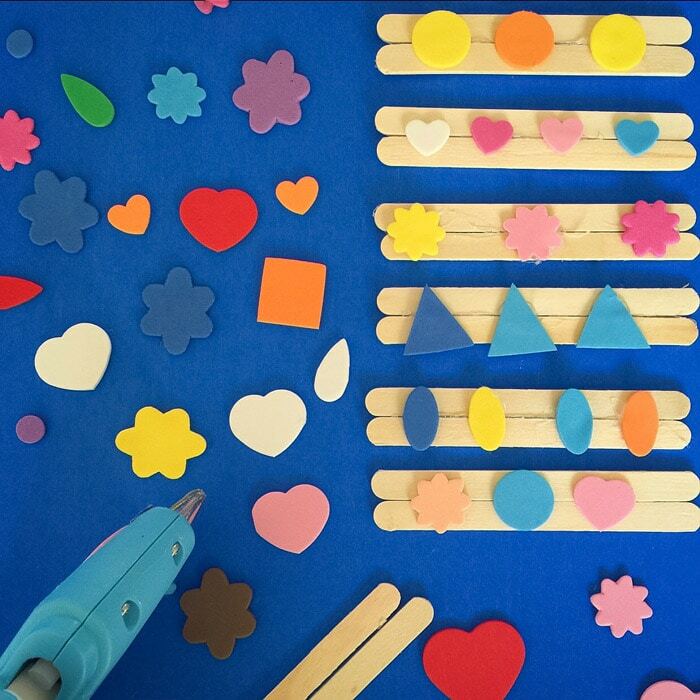 These popsicle sticks are used to create beautiful art that is easily turned into counting puzzles. 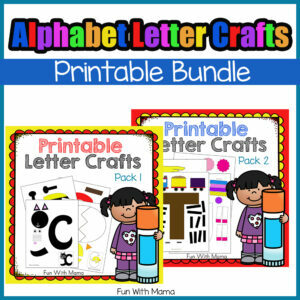 Kids will LOVE that they can learn to count with puzzles that they made themselves! This popsicle stick puzzle or these sensory color sticks are also fantastic for helping children recognize colors! Another fabulous STEM activity with ice cream sticks is to make catapults. With just a few supplies and a stack of ice cream sticks, kids can make their own catapult. This is not only a STEM activity but kids are making their own toy. 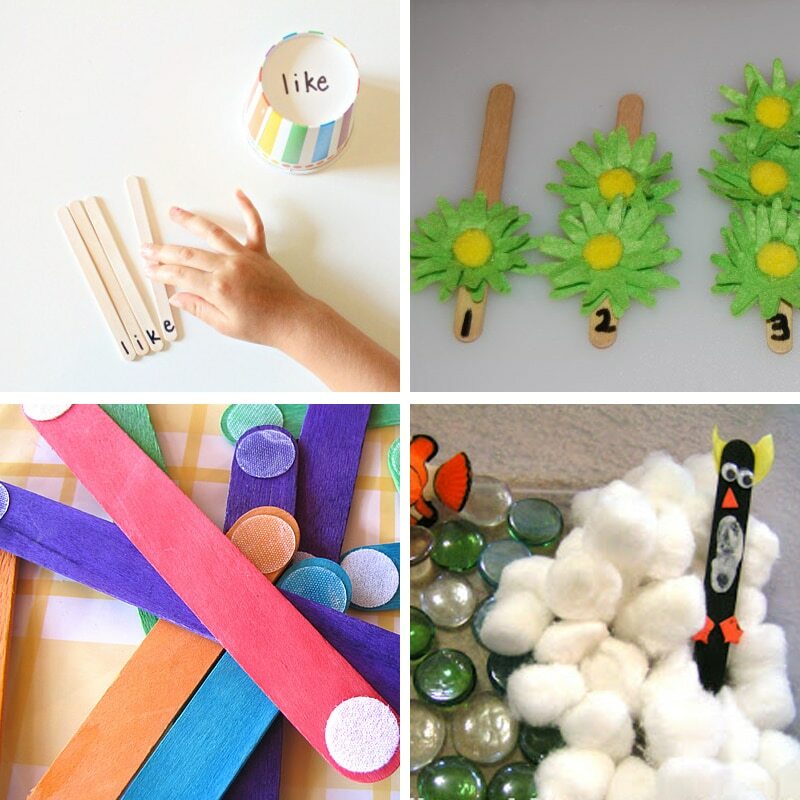 Fine motor skills are practiced and strengthened with this Popsicle Stick Flowers activity. 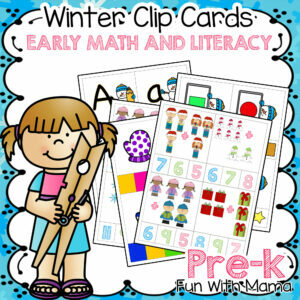 It is super easy to put together and kids can have hours of fun while learning math. Puzzles are fantastic for helping children work their mind in a fun and playful way. This Minion Puzzle is created with ice cream sticks and is a great way to hone in on your child’s interests and encourage learning. Learning to count is incredibly important but doesn’t have to be a chore. This popsicle stick learning activity, sticker counting sticks, will have your kids counting in no time! Another fun STEM creation with ice cream sticks is this fun popsicle stick glider. It only needs a few supplies and a stack of popsicle sticks and your kids will be flying in no time. If your kids love building, these Velcro Dot Craft Sticks might be right up their alley. The velcro dots allow the sticks to combine and kids can create, tear down and create some more. These building idea cards will help keep the creation flowing! These popsicle stick penguins are the perfect addition to any winter or arctic sensory bin! I like how true to life they actually look! Pick up sticks is remembered as a favorite classic childhood game. 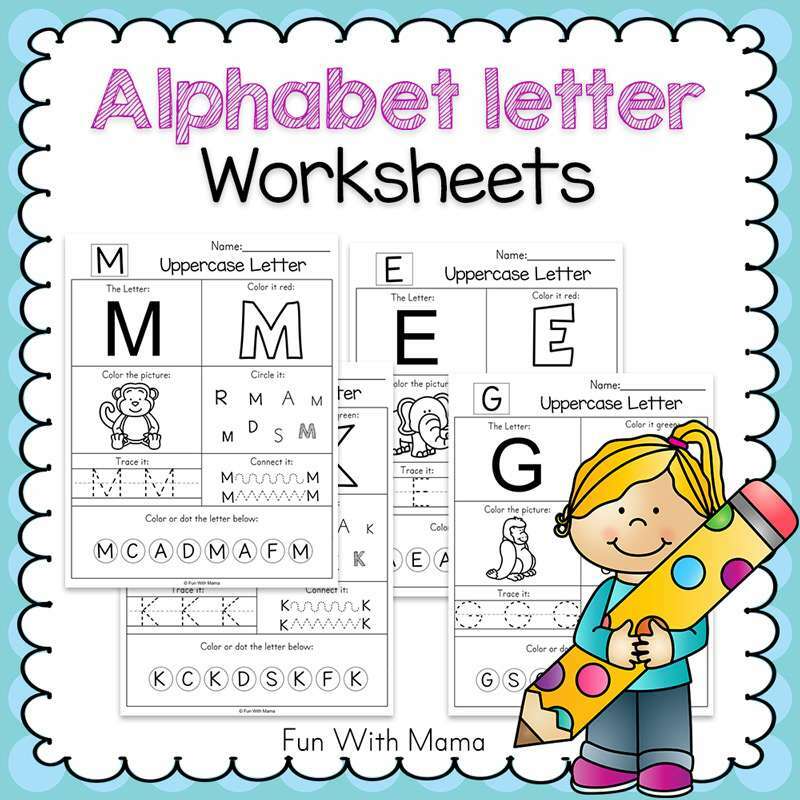 This Sight Word Spelling Game is very similar but can help kids learn the spelling of sight words as well. This is a fun pick up sticks version for toddlers as well.